The decision to use two colours in naming the men on this Memorial was not a wise one. The red initials used on the lower names (i.e. the Roll of Honour) have not worn well but not as badly as the names of the dead (above) which are now almost illegible. Hopefully, this board will get a much-needed refurbishment in the not too distant future. These names are written in full. in red. in the upper part of the Memorial board. 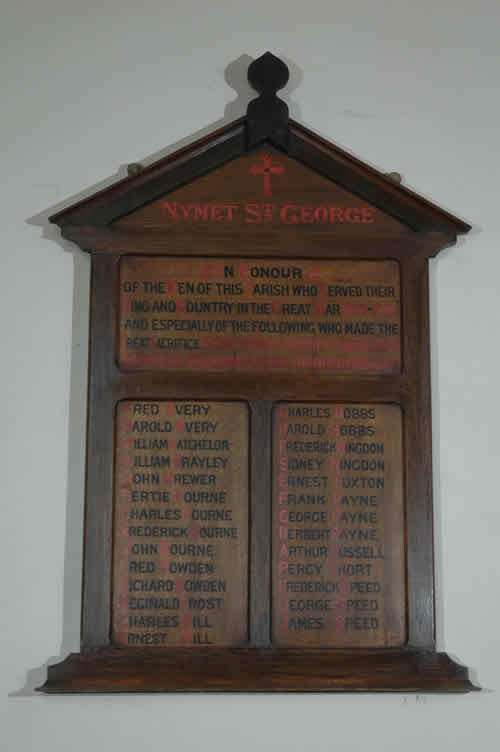 IN HONOUR OF THE MEN OF THIS PARISH WHO SERVED THEIR KING AND COUNTRY IN THE GREAT WAR 1914 - 1918 AND ESPECIALLY THE FOLLOWING WHO MADE THE GREAT SACRIFICE. 66146 Private Sidney Bowden of the Royal Army Medical Corps. Son of George and Jane Bowden. Born in North Molton in 1882. Died 15 March 1918 aged 36. 52372 Private Robert William Grimshire of the 7th Battalion, the Royal Fusiliers; formerly S/2/13776 of the Army Supply Corps. Son of William and Emma Grimshire. Born in South Molton in 1894. Died 16 April 1917 aged 23. 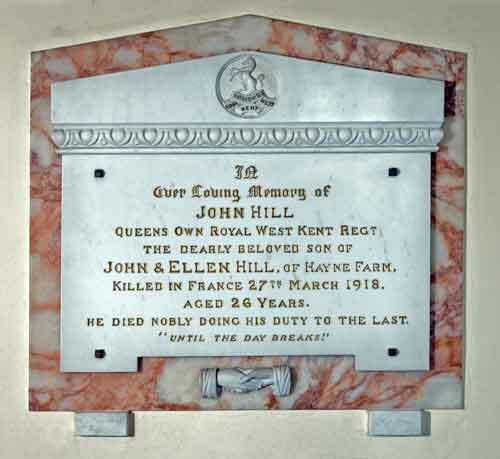 242179 Private John Hill of the 6th Battalion, the Queen's Own Regiment (Royal West Kents). Son of John and Ellen Hill of Hayne, George Nympton. Born in Rose Ash in 1894. Died 26 March 1918 aged 24. G/22003 Private William Hobbs of the 6th Battalion, the Buffs ( East Kent Regiment). Son of Henry and Jane Hobbs; husband of Letitia Hobbs. Born in George Nympton in 1880., lived in Sedlescombe, Sussex. Died 20 September 1918 aged 38. 205418 Private Herbert James Kingdon of the 4th Battalion, the devonshire Regiment. Son of John and Elizabeth Kingdon; husband of the late Bessie Kingdon. Born in George Nympton in 1871. Died 27 June 1917 aged 46. Buried in the churchyard in George Nympton. © Richard J. Brine .